This little set can go from seating four to seating two with simply dropping the two leaves. 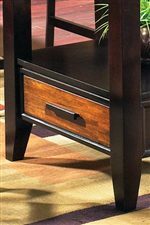 A great look for any room with its solid acacia wood top and contrasting dark brown base and legs. Comfortable chairs with scooped out solid seats and contoured backs. 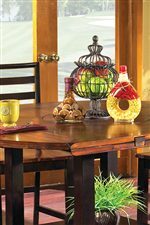 A versatile set perfect for a small kitchen, porch, sun room, cabin or game room. The Abaco 5-Piece Drop Leaf Leg Table with Ladder Back Chairs by Steve Silver at Walker's Furniture in the Spokane, Kennewick, Tri-Cities, Wenatchee, Coeur D’Alene, Yakima, Walla Walla, Umatilla, Moses Lake area. Product availability may vary. Contact us for the most current availability on this product. Table Info 42" round with leaves up. 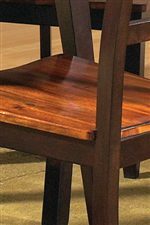 Leg table with a solid acacia top and solid dark brown legs. Side Chair Info Ladder back side chairs with scooped out solid seats.